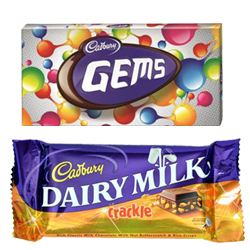 A beautiful gift of a Pack of Cadbury Gems ( 27.50 Gms.) and a pack of Crackle Chocolates ( 42 Gms.) from Cadburys. Celebrate a cute n sweet.